Ketchum resident Charles Friedman has been appointed to serve the remaining term of former Ketchum City Councilman Larry Helzel, who stepped down as of Feb. 29. 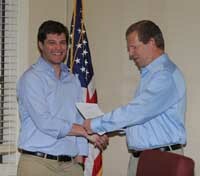 Mayor Randy Hall nominated Friedman; the City Council unanimously confirmed the appointment Monday. Friedman took his place on the council immediately following the council's vote. "This is an exciting opportunity," he said in an interview. Friedman is a commercial relationship manager at Zions Bank. He has worked at D.L. Evans Bank and First Bank of Idaho as a commercial credit analyst and is a graduate of Colgate University in New York. He moved to Ketchum from New York City in 2001. Hall approached Friedman about the vacancy after seeing him at community meetings. "Charles is a good fit for this appointment," Hall said in a news release. "He is a young professional who is passionate about Ketchum and works hard as a volunteer to enhance Ketchum's quality of life. He is thoughtful [and] articulate, and with his background will bring a fresh perspective to our City Council." A special election May 15 ultimately will determine his seat, as well as that of Curtis Kemp. "I intend to throw my hat in the ring," Friedman said. As of Tuesday at noon, Mickey Garcia was the only person who had filed to run. The deadline to file to run for a Ketchum City Council seat in May's special election is Friday at 5 p.m. Candidates must be at least 18, a U.S. citizen and a Ketchum resident for at least 30 days before filing. Declarations of candidacy are available at the Ketchum city clerk's office in City Hall between 8:30 a.m. and 5 p.m., Monday through Friday. Along with declarations of candidacy, candidates must submit a $40 filing fee or a petition of candidacy signed by at least five qualified Ketchum electors, verified by the county clerk. Paperwork must be filed with the city clerk.